Krishna Kumari's reality is harsh and painful. It is not lyrical fiction and does not end like the Romeo-and-Juliet romance. Queens and princesses are the current theme, especially if they belong to Rajasthan and Sanjay Leela Bhansali gets roughed up for attempting a film on Rani Padmini. But instead of courting controversy, how about celebrating the true princess? A princess worthy of being remembered. A princess worthy of being honoured. And a princess who merits a movie dedicated to her memory. This story belongs to a time when eye witnesses documented events as they unfolded. It was the close of the 18th Century. Mewar was then ruled not from Chittaurgarh, but from Udaipur. Maharana Bhim Singh sat on a shaky throne. His kingdom was subjected to ravages by Marathas, and Amir Khan - the Pathan with his mercenary band. He needed a political alliance to lend him courage and military strength. His baby daughter, born of his chief queen, was betrothed to the young Maharaja of Jodhpur (the capital of Marwar). The infant Krishna Kumari was an important person. On July 21, 1810, the court of Udaipur called for Rajkumari Krishna Kumari. Was she prepared to die to save the lives of her people? Marwar was rife with trouble and Krishna’s fiancée battled his half-brother Man Singh to hold on to his throne. But when Krishna was no more than nine-years-old, Mewar was plunged into grief. Their little princess’ fiancée had died. His wives were joining him in the pyre. Though she had been spared the flames of the pyre, she would now go unmarried the rest of her life. Imagine the joy and relief when Maharaja Sawai Jagat Singh of Jaipur (capital of Dhoondhar; old capital city – Amber), asked for the then twelve-year-old’s hand. Mewar rejoiced and accepted the proposal. But would the child be permitted to be happy? Thakur Sawai Singh of Pokaran, a rebel chieftan of Marwar was then a refugee in Jaipur. He sent a message taunting the new Maharaja of Jodhpur – Maharaja Man Singh. Princess Krishna Kumari, who was betrothed to the throne of Marwar, was now going to marry the Maharaja of Jaipur. What a shame! Maharaja Man Singh (the man lost his wits by the end of his life) took up the gauntlet. Scindia, who had been denied some money by Jodhpur, joined Jaipur’s camp and swung into action. The nobles of Mewar trembled and the wedding was cancelled. 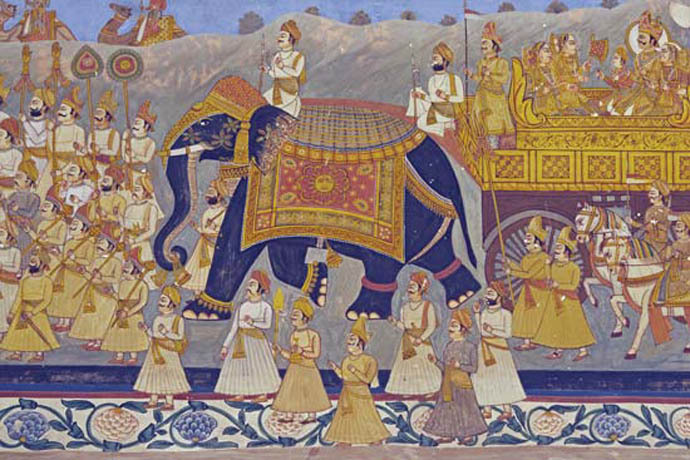 Humiliated, the Maharaja of Jaipur marched in with his army to face the forces of Jodhpur. The Maharaja of Jodhpur was let down by his own Rathore chieftains at the very last moment and was prevented by a faithful friend from committing suicide. Together, they fled, pursued by the forces of Jaipur and the Rathore nobles. Maharaja Man Singh locked himself up in the fort of Mehrangarh. Mehrangarh was besieged for six months. But the great fort did not give way. The army of Jaipur wasted away in the desert land and finally decided to go home empty-handed. Would Krishna live in peace now? No. Defeated but still undaunted, the king of Jodhpur approached his old enemy - Amir Khan - the Pathan who was later granted the state of Tonk by the British in exchange for giving up his mercenary activities - to negotiate on his behalf in exchange for a handsome sum of gold. The Pathan swaggered into the courtroom of Udaipur announcing: Should the princess marry the king of Jaipur, he, Amir Khan, would raze Mewar to the ground. The Khan took vicious pleasure in tormenting Krishna’s father, a man no older than himself. The choices were placed before the court of Udaipur: No matter whom Krishna married, it would be Mewar that would turn into a battleground. It would be the common people of Mewar who stood to lose their lives and lands. But she was an important person in the hierarchy of Mewar. Her life could only be taken by someone who equalled her in status. Her father pleaded with Daulat Singh of Karjali to carry out the deed. But when the 16-year-old princess stood before him, the dagger fell from his hands. Daulat Singh turned to the Maharaja, crying that whoever gave such an inhuman order should have his tongue cut out. At last the women of the rawala (zenana) took up the responsibility. The brave little princess quietly went to a private garden near the palace, to prepare herself with prayers. A cup of poison was brought to her in her father’s name. The princess bowed, offered another prayer for her father's life and prosperity, and drank the contents. A second cup was brought. It too failed. The sentence was attempted a third time, but without the desired result. Finally, a strong cup of opium was prepared. Krishna Kumari accepted it with a smile, drank it, and fell into a deep sleep, from which she never rose. The the three earlier cups would have caused great suffering to the girl without bringing the relief that comes with a coma or death. And yet she persevered and did not give up the cups that were brought to her. Relieved and yet crushed emotionally, her father turned her apartment into a shrine, dedicating it to the memory of her courage. To choose death instead of putting the lives of their people at risk. To choose death instead of putting the honour of their dynasty at risk. Reality is harsh and painful. It is not lyrical fiction and it does not have Romeo-and-Juliet kind of endings. The delicately frescoed Krishna Mahal is now a memorial to the girl (photography not permitted) in Udaipur's City Palace, where respect can be paid to a brave little princess who became the victim of political circumstance. The room contains some of Mewar's best miniature paintings. Physician and author now working with nutrition in Indian diets.